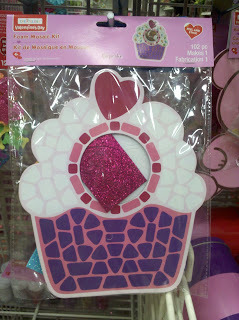 Super cute Cupcake Mosaic Craft kit found at Michael's Arts and Crafts this week! I love your cute little finds! Those would be great Valentine's Day crafts and such. Did you see all the super cute cupcake stuff at Target Dollar Spot? Cupcake socks for kids, a pad of sticky notes, cellophane bags with ties, and more! For Valentines, I guess. But all cupcake-y!